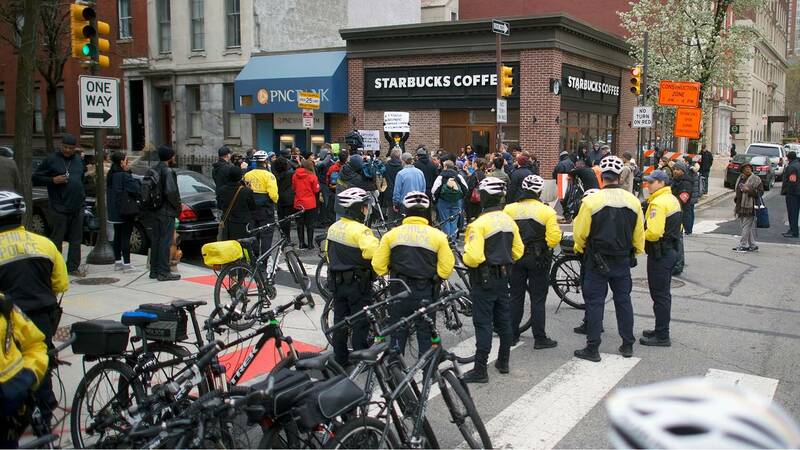 Police officers monitor a protest outside a Center City, Philadelphia, Starbucks on April 15, 2018. After a Starbucks manager called 911 in Philadelphia on two black men sitting in the store the company announced Tuesday it will close all of its company-owned stores on the afternoon of May 29 to conduct education for its employees to prevent further racial bias. Starbucks announced the training in a news release, days after a video of two black men being taken out of the store in handcuffs by police went viral. The Starbucks manager called 911 as the two men were waiting in the store without ordering anything while waiting for a third person. Starbucks CEO Kevin Johnson met with the two men Monday to apologize, reports Philly.com. The May 29 training will be offered to 175,000 employees across their U.S. stores and will become a permanent part of training for new employees, according to the news release. The training will be developed with experts confronting and preventing racial bias, including the Equal Justice Initiative, the NAACP Legal Defense and Education Fund; Heather McGhee, president of Demos; former U.S. Attorney General Eric Holder; and Jonathan Greenblatt, CEO of the Anti-Defamation League, according to Starbucks officials. There are more than 40 Starbucks locations across Orlando. "We will learn from our mistakes and reaffirm our commitment to creating a safe and welcoming environment for every customer," Starbucks executive chairman Howard Schultz said. After outrage from the Philadelphia incident, Starbucks is reviewing its training and practices.